The best recipe for authentic Thai Sticky Rice cooked in a steaming basket the way that it’s really made in Thailand. My absolute favorite way to eat Thai rice and it comes out perfectly every time! Mr. Wishes got me the most amazing Christmas present a few years ago – this Thai sticky rice steaming basket. He ripped on me and nagged me to death (just kidding, honey) because it took me a whole YEAR to finally use it. It was literally the following December that I finally busted it out for the first time. It was kind of one of those “out of sight, out of mind” things because it was a space-taker-upper so when we lived in the apartment I used to stash it away in a closet because I didn’t have the counter space and it was just forgotten about. It wasn’t that I didn’t like my gift – I LOVED it…LOVE LOVE LOVE. I was just neglectful of it. Now that I’ve gotten a taste of what this baby can do, it’s never going to be forgotten about again. OK, I’ll tell you what the gift was. It was a Thai sticky rice kit. 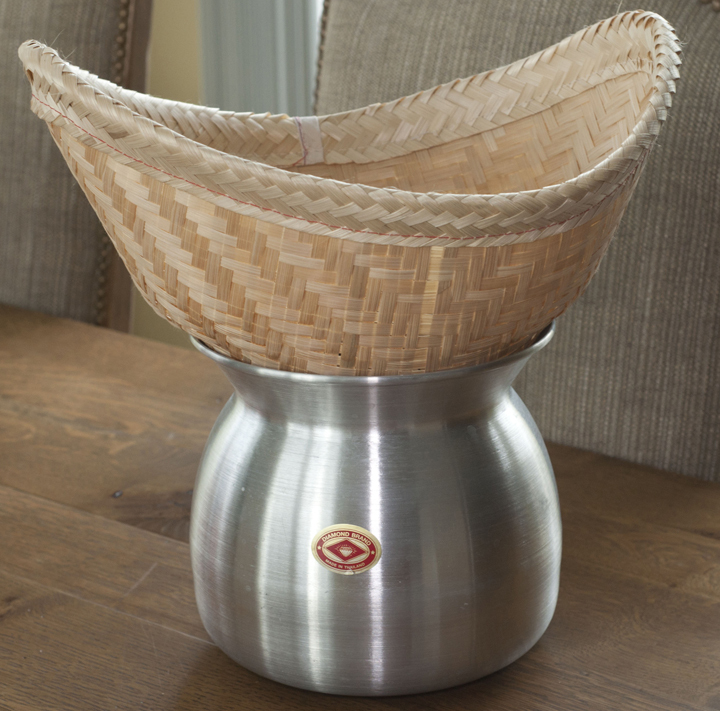 It includes a quality aluminum steaming pot imported from Thailand, a steaming basket, cheesecloth and 5 whole pounds of sticky rice. FYI: Thai sticky rice is also known as “sweet rice” or “glutinous rice”. 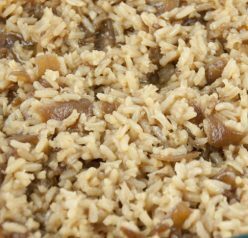 The label “sticky” is fitting, as the cooked rice can be pinched off in clumps that holds together firmly. Technically, that’s the way you are supposed to eat it – with your fingers. I always feel judged by the people sitting around me when I eat it this way in a Thai restaurant but don’t care enough to stop. I’m just so proper like that. I am absolutely crazy about Thai food. When we lived in the apartment we had the BEST EVER Thai restaurant right across the street from us called Phuket Thai. We were there often……..I won’t even tell you how often because it’s embarrassing. This is the place that got me hooked on sticky rice. I absolutely needed to learn how to make it at home. I tried time and time again but never could quite get it the same as the restaurants. The texture just was never right. This kit changed that all for me and I can make the perfect Thai sticky rice anytime I want right in my own kitchen. This is great since we have now moved to a house over a half hour away from our go-to Thai restaurant! I like to make it on a day I plan to be home because the rice has to soak for 4-6 hours before it’s steamed. Totally worth it. At times, I have soaked the rice overnight or set it in a bowl on the counter when I left for the day. After the soaking period, it’s super simple. You just put in the basket wrapped with cheese cloth and let it cook. That’s all there is to it. This goes great as a side dish to any Thai dish (my favorites being this Pad Thai or Peanut Chicken Tacos) and it’s best dipped in some peanut sauce! If I didn’t bore you to tears yet and you are still reading, God bless your soul. 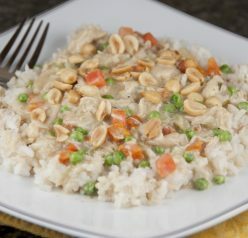 For a light meal, this Thai sticky rice would go well with this Thai Cashew Chicken Salad from my friend Tanya. Have a great day! Thai recipe for authentic Sticky Rice the way that it's really made in Thailand. My favorite way to eat rice! Thai Sticky Rice (must use this rice and not a substitute), also known as "sweet rice" or "glutinous rice"
Rinse rice 2-3 times, until water runs clear. Place rinsed rice in a bowl and fill with cool water so the water is approximately 2-3 inches above the rice). Let the rice stand in water for 6-8 hours. Drain the rice, place it in a cheesecloth, wrap it up and put the cheesecloth inside bamboo steamer. Put 6-8 cups of water in sticky rice steamer. Then place bamboo steamer inside sticky rice steamer. Be sure the bottom of the bamboo steamer does not touch the boiling water. Place a standard 8 inch lid loosely over the top of the bamboo steamer. 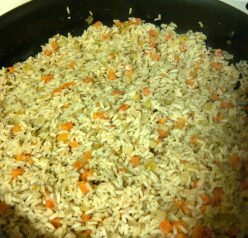 Now turn on the heat (Med/High) and steam the rice for 45 minutes (or until tender). Enjoy! Hint: after sticky rice is cooked, remove from cheesecloth promptly. What a great gift! I may have to add that to my holiday wish-list. I’ve always thought about getting the supplies to make proper Thai sticky rice. I’ve never been able to get it quite like the rice I had when I visited there and I love it!! I’ve always wondered how you achieve the texture of sticky rice. I had no idea that you used a bamboo steamer! I so want to try this! That bamboo steamer is so cool. The only way I can eat rice with chop sticks is if it’s sticky! Looks great! Oh my gosh, how fun is that kit!? And I loooove sticky rice – the whole family does. I need to make a huge batch. 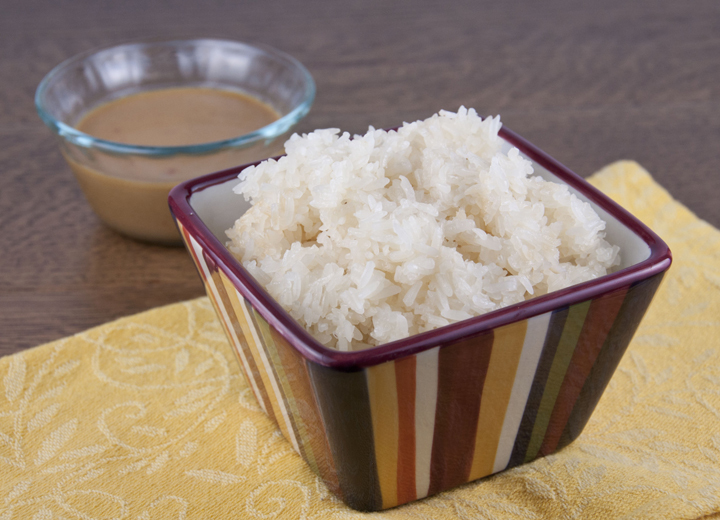 What a great gift – now you can have Thai Sticky Rice @ home whenever you want it! I had no idea you needed a special steamer for sticky rice! This looks delicious! So cool! It sounds delicious! Thanks Ashley – I learned something new today, I had no idea rice was to be soaked before steaming for sticky rice! i have actually eaten this sticky rice made by none other than Mrs. Wishes. It was awesome! Thanks! Ahhhhhh!!!! A comment from Scott! Never thought I’d see the day 🙂 Thanks, Scottie! Having cooked rice at least 5000 times in my life, you’d think I’d know about the procedure for sticky rice! Well, I had no idea about the soaking! Learn something new every day. I have trouble with sticky rice and now I’m thinking it is because I don’t have the correct equipment! PS- Can’t wait to see you next week! Looking forward to seeing you, too! Can’t wait!!! We used to live near the best thai restaurant … and now that we moved I haven’t found anything like it. Boooo. Guess it’s just time to make my own sticky rice! This is awesome. I love sticky rice but never thought of making it at home. I’m having major kitchen gadget envy. This is going on my wishlist! What a cool gift! The sticky rice sounds delicious! Perfect rice is so divine. I loved reading about the technique to make sticky rice – hungry for it now! Thai food is beyond amazing and I really LOVE Pad Thai! I didn’t know that they even made a sticky rice maker! I need that! I have never made sticky rice at home but love having it when I’m out and about. What a fantastic gift Ashley! What a great present…isn’t it funny how we want things really bad…get them…let them sit then use them finally and wonder how we ever lived without them!! That is just the coolest kitchen toy ever. I want it, I need it, I must have it. Plus sticky rice, hello, this is like the perfect post. I always wondered how that rice is done! I have never seen anything like that basket, I have to have one! My daughter loves to make homemade sushi, so we definitely need this!